If you love varmint hunting, you know how satisfying it feels to make clean, instantaneous kills. 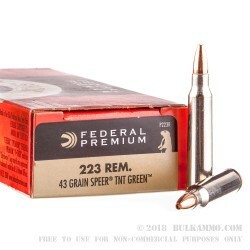 With this 223 Rem cartridge from Federal Ammunition’s V-Shok line, you’ll be perfectly equipped to pull off as many of them as your aim permits. 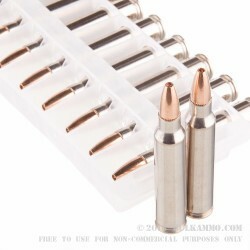 This cartridge features a 43 grain Speer TNT Green hollow point projectile. Its thin copper jacket is fitted tightly over its compressed powdered core to provide explosive expansion and energy release on varmints, so you’ll never be bothered by the same woodchuck twice. A muzzle velocity of 3,600 fps tends to convey that in general, even without such a high performance, match grade accurate bullet. Perhaps best of all, this bullet is completely lead free, so the varmints you don’t get in your crosshairs can continue on enjoying a pristine and healthy habitat. Everybody wins! 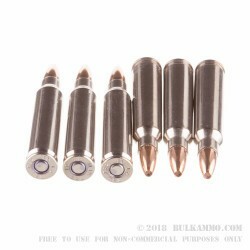 This cartridge also offers a non-corrosive Boxer primed brass casing, so you’ll be able to reload to keep these 20 rounds alive for a long time.